Figure 6-29. - Splash-type lubrication system. Now that you are familiar with the lubricating system components, you are ready to study the different systems that circulate oil through the engine. The systems used to circulate oil are known as splash, combination splash force feed, force feed, and full force-feed. The splash system is no longer used in automotive engines. It is widely used in small four-cycle engines for lawn mowers, outboard marine operation, and so on. 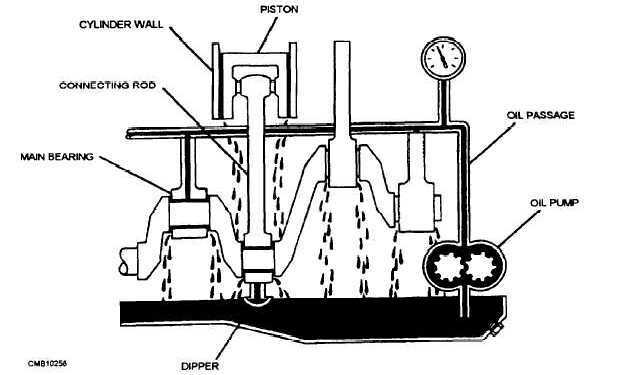 In the splash lubricating system (fig. 6-29), oil is splashed up from the oil pan or oil trays in the lower part of the crankcase. The oil is thrown upward as droplets or fine mist and provides adequate lubrication to valve mechanisms, piston pins, cylinder walls, and piston rings. In the engine, dippers on the connecting-rod bearing caps enter the oil pan with each crankshaft revolution to produce the oil splash. 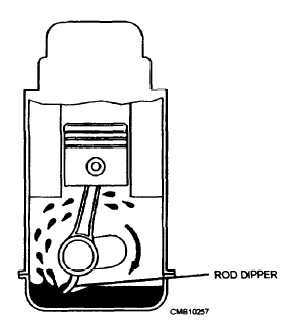 A passage is drilled in each connecting rod from the dipper to the bearing to ensure lubrication. This system is too uncertain for automotive applications. One reason is that the level of oil in the crankcase will vary greatly the amount of lubrication received by the engine. A high level results in excess lubrication and oil consumption and a slightly low level results in inadequate lubrication and failure of the engine. Figure 6-30. - Combination splash and force-feed lubrication system.